Peru has declared a 60-day state of emergency in towns in 14 regions to brace for possible damage from the climate pattern El Nino in the rainy season, state media reported Sunday. Peru has forecast a “moderate to strong” El Nino in the winter season and has not ruled out an extraordinary event in the summer, which begins in December in the southern hemisphere. The phenomenon, a warming of Pacific sea-surface temperatures, has wreaked havoc on local fishing in Peru and triggered landslides in years past. What has this got to do with health? Everything! Back around the turn of the 19th century (the late 1800s), cycles became a pop culture craze (like dozens of times before, and after). During the early 1900s, professional journals began talking about the cycling of weather, and its effects upon finances, crop production, the job market, and the resulting political and social turmoil these changes often created. The American Meteorological Association came to be around 1910, and a number of theories for cyclic weather patterns were published. The most popular one was the Sunspots Theory, which claims that weather patterns were impacted by the changes in solar radiation related to sunspot activity due to the solar flares and “solar wind” that were produced. Now, all of these changes in the energy patterns for the Solar System were in fact quite true. But the association of these natural events with manmade events on the earth’s surface was hard to accept. So those in favor of this theory found many more ways to support it. Some even proposed secondary cyclic patterns, which went in and out of resonance with the sunspot cycle. This explained still more events then awaiting recognition. The cycling of finances, in particular stock prices were still hard to accept this as an explanation for. We could easily accept this argument for food industry products like corn, soy bean, grains. Meteorologists had demonstrated some links between drought and the solar cycles. That was enough to hush everyone who was against this theory–it had indirect implications–hard to provide either way. But then out came a new rendering of this sunspot theory in the 1980s–the La Nina-El Nino cycle theory. It provided another explanation for atmospheric changes, that couldn’t always be correlated with the solar winds (which are true events, the winds are energy related). When I returned to college it was my intent to link the Asiatic Cholera outbreaks over time to this philosophy. I spent several years researching this, even returning to some of my dendrochronology work that I did back in the 70s. But then, I turned to the Cycles journals again, and took issue with how the natural cycles were being compared once again to finances, automobile manufacturing and sales, changes in gas and electricity stock prices. An ecological approach to studying cholera cyclicity and peak outbreak times, based upon La Nina-El Nino theory, was in fact possible, due to the use of GIS to review these past popular culture themes. Naturally, over time, my interest in the cyclicity diminished once GIS came to be my tool at hand, instead of my handy increment borer for extracting tree rings and using the tree ring cycle data sets shipped to me from the leader in this field (evaluated on a 286 PC). EMR/EHR, Big Data, the iCloud, and GIS can now be used to test these older pop culture theories. We can prove once and for all whether or not the cost for growing coffee beans in parts of Africa will influence the country’s ability to control its other social and economic problems, not to mention the events leading to the next spread of Ebola. Yes, there is another cycle starting, but now we can begin to monitor it from day one. If and when there is an outbreak, we can define how and why it had everything to do with El Nino, or nothing at all to do with the oscillation of global energy patterns. This cyclicity and global energy phenomenon was also used to explain global outbreak patterns in the mid-19th century. The British Surgeon in Charge at the Military Hospital in Crimea, Ukraine, was removed to Jamaica in the Caribbean following the medical disaster that struck that place during the Crimean War. In Jamaica, he came up with his theory as to how the magnetic fields generated by the earth could be the cause for the moving and cycling of yellow fever outbreaks around the world. The earth’s magnetic fields moved about, as did the yellow fever outbreaks. 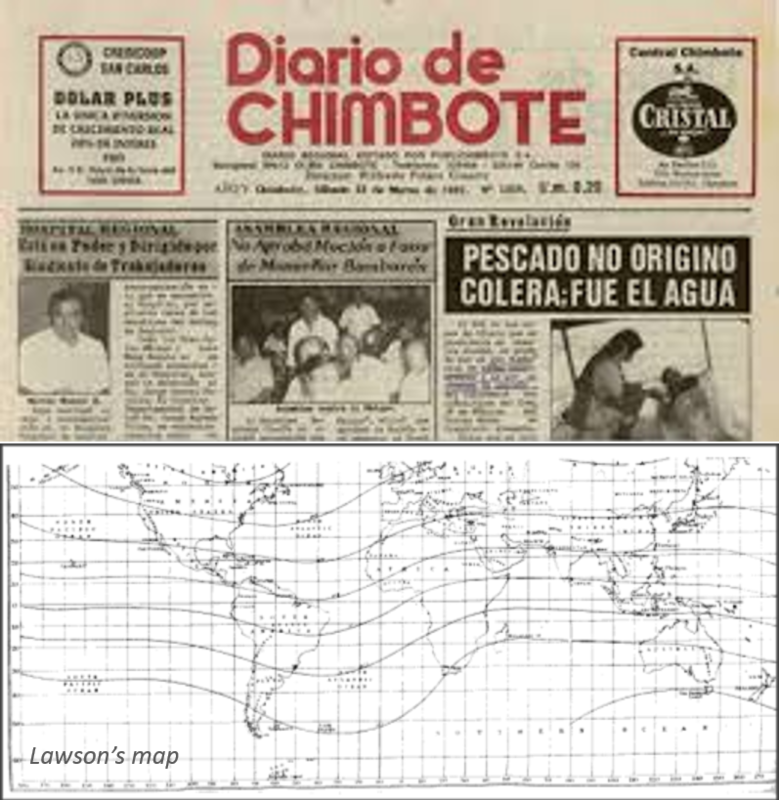 As a result, his theory–Robert Lawson’s Pandemic Waves Theory–was published by esteemed medical journals. After all, he was a member of some of the Royal medical societies. He drew up what he called “the World Isoclines Map” ca. 1860-1875, and used it to explain the outbreaks. We are back to square one with evaluating the impacts of climate and natural cycles on disease patterns and outbreak behaviors. With the right GIS in place, this controversial issue could have been resolved ten or fifteen years ago, all except the cycling periods of indecisiveness that politics and medicine–global health patterns–are riddled with. Perhaps it may take a recurrence of a past disastrous outbreak, to lead to enough research, to at least resolve this issue once and for all. And even then. we may still be left not knowing how and why Chikungunya, MERS and Ebola behave the way they do–but of course that may also be due to the lack of GIS implementation, for people health, not just ecological health. Peru by the way is a hot spot for vibrio ecology studies and a natural setting where vibrio has become naturalized. It bears the classical and two most dangerous strains are linked to this Asiatic Cholera disease nidus, in particular the El Tor.